The Distinguished Eagle Scout Award, established in 1969, acknowledges Eagle Scouts who have distinguished themselves on a national level, receiving recognition or eminence in their field, with a strong record of voluntary service to their community. 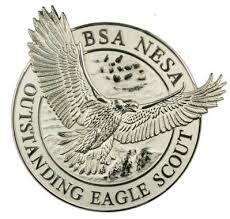 Only Eagle Scouts who earned the rank a minimum of 25 years previously are eligible. The award is presented by the National Eagle Scout Association upon the recommendation of a committee of Distinguished Eagle Scouts. 1994 | Jayme, Dr. David W.
1985 | Benson, James M.
1984 | Wurster, Vesper L.
1978 | Littlewood, Douglas B. Sr.
2014 | Michael M. Meyers, Chris Collins, Donald I. Dussing, Jr.